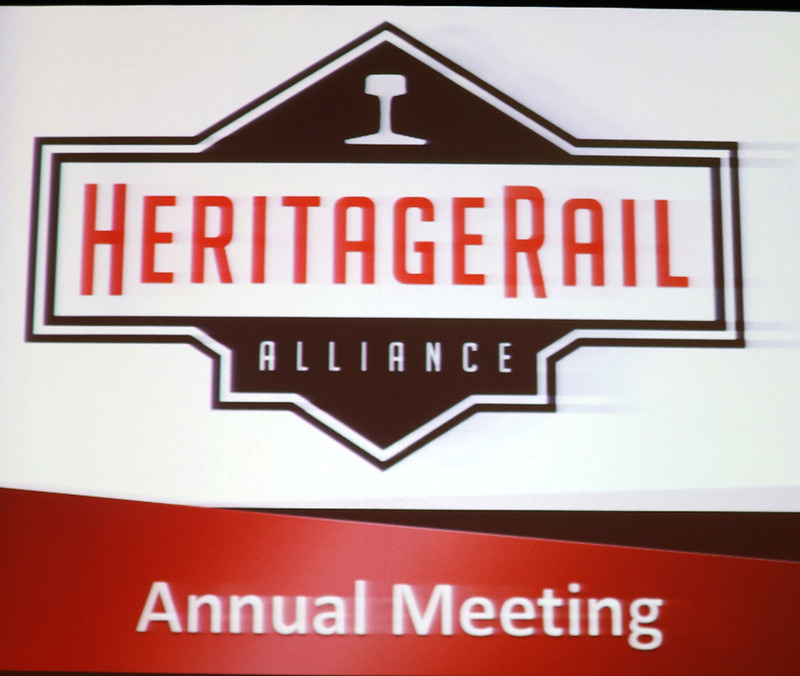 The HeritageRail Alliance annual Fall Conference traveled north to the Twin Cites of Minneapolis-St. Paul, hosted by the Minnesota Streetcar Museum. 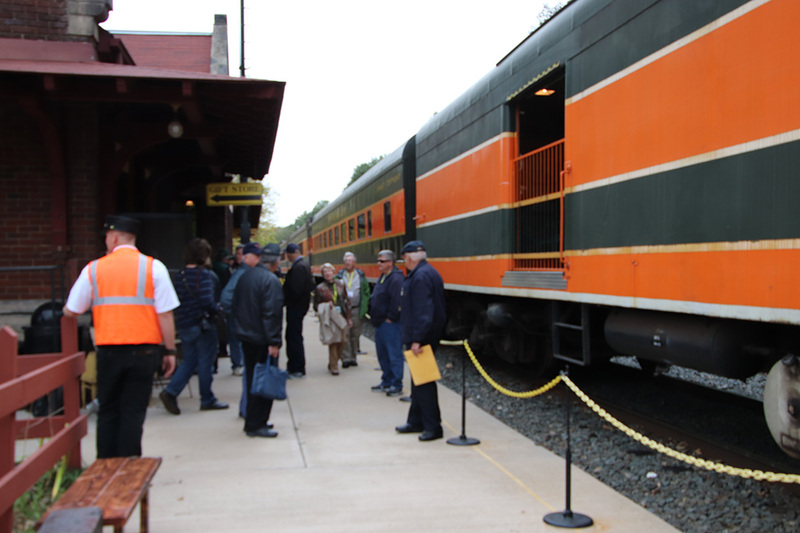 The conference featured three pre-conference trips, outings to seven local railway heritage sites, 22 seminar sessions, and a selection of vendors. Oct. 3 Minnesota rail expert and TRAINS magazine correspondent Steve Glischinski led a bus tour of Twin Cities rail sites. 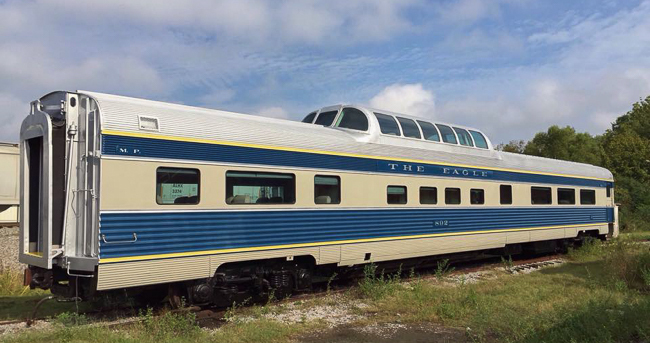 He was accompanied by Railfan & Railroad magazine preservation columnist Jeff Terry, who also lives here. 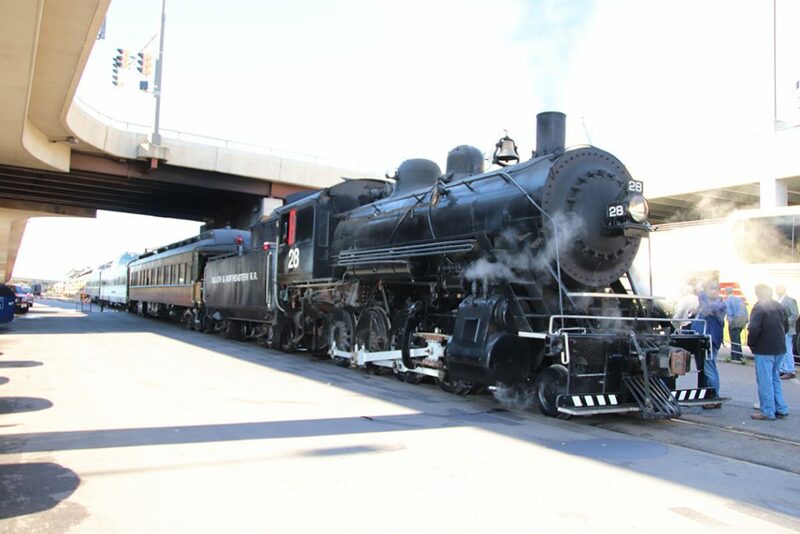 They visited all the local rail yards and hot spots, including a tour of the Minnesota Commercial Railroad, owner of an eclectic fleet of vintage diesels and the last active roundhouse in town. Other stops included the preserved Newport Tower, Minnehaha Park depot and the Milwaukee Road depot downtown, complete with surviving train shed. The tour ended with a round trip on the Northstar commuter rail line. The HRA Board of Directors met all day. Oct. 4 Two busloads headed for Duluth, where we visited the Lake Superior Railroad Museum. Inside the Lake Superior Railroad Museum. 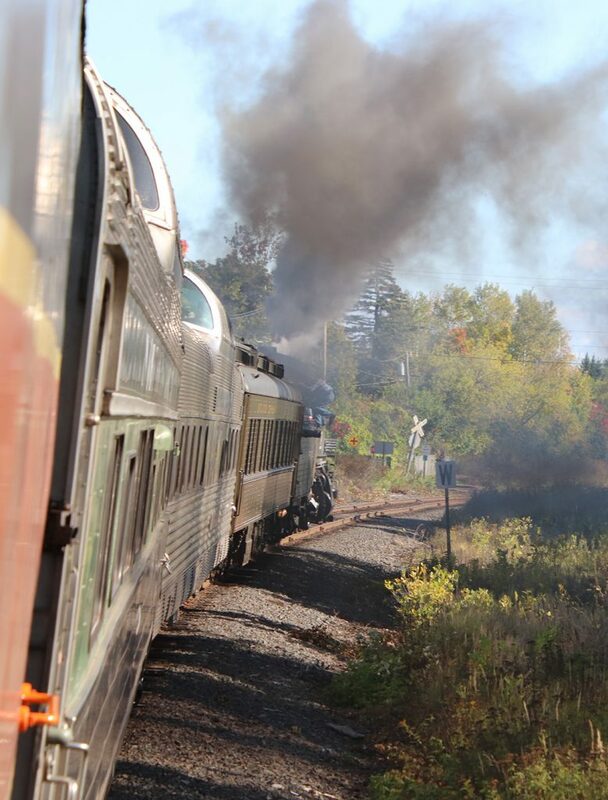 Next came a rode a round trip on museum’s North Shore Scenic Railroad to Two Harbors. The train, which featured two dome cars and Duluth Missabe & Iron Range heavyweight business car Northland, was pulled by newly restored Duluth & Northeastern 2-8-0 #28 (Alco Pittsburgh 1906). 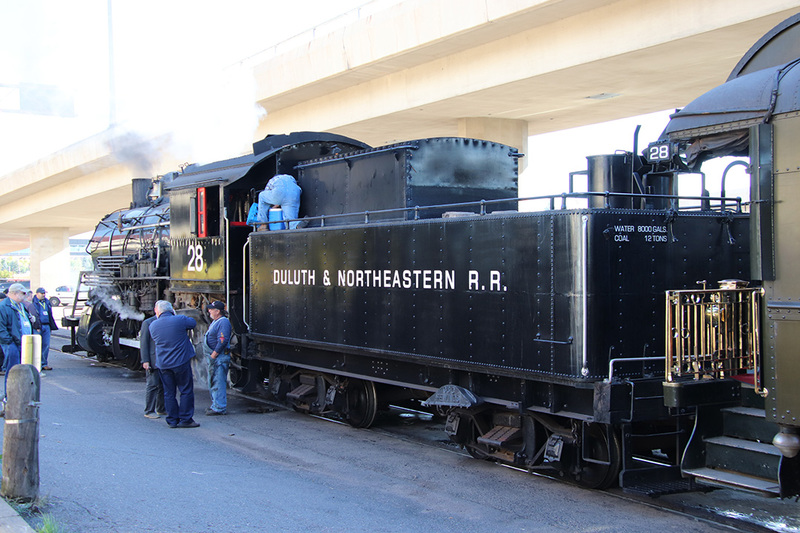 The HRA special prepares to leave Duluth. Everything went well until we were stabbed by a Canadian National ore train outside of Two Harbors. Being on a tight schedule, the trip was cut short and the accompanying diesel pulled us back to Duluth. Meanwhile, back in the Twin Cities, a 1954 city bus toured remnants of the streetcar system. 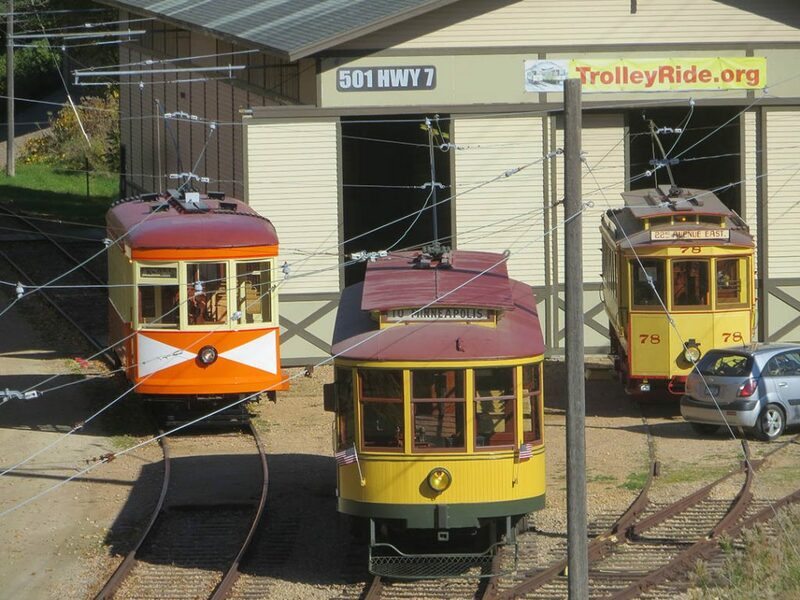 After lunch in St. Paul, the group rode the Green Line LRT to Minneapolis, where the bus met them and took them to the Minnesota Streetcar Museum’s Como-Harriet Streetcar Line for guest motorman operations. Oct. 5 The morning was spent in seminars and visiting the vendor room. At noon everyone piled onto buses for the one-hour trip to Osceola, Wisconsin. 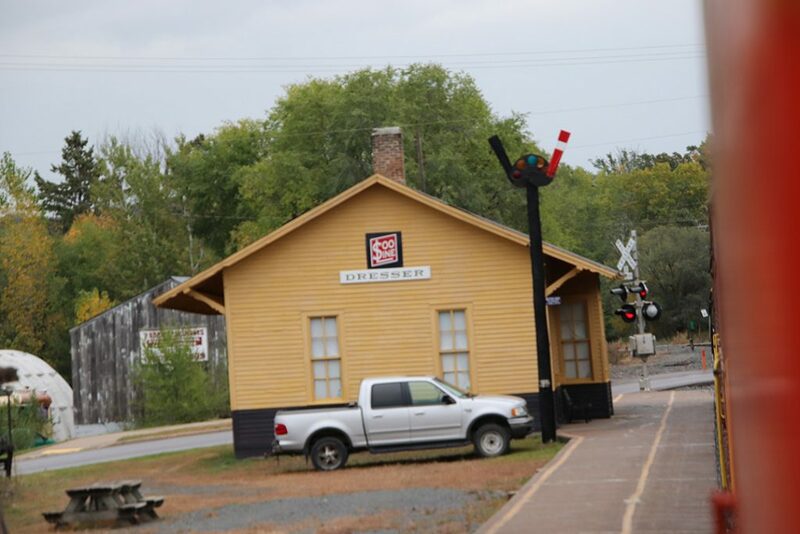 There we rode the Minnesota Transportation Museum’s Osceola & St. Croix Valley Railway. It was fall color season, the line’s busiest time of the year. The railroad fields an 8-car train that can carry 400 passengers. 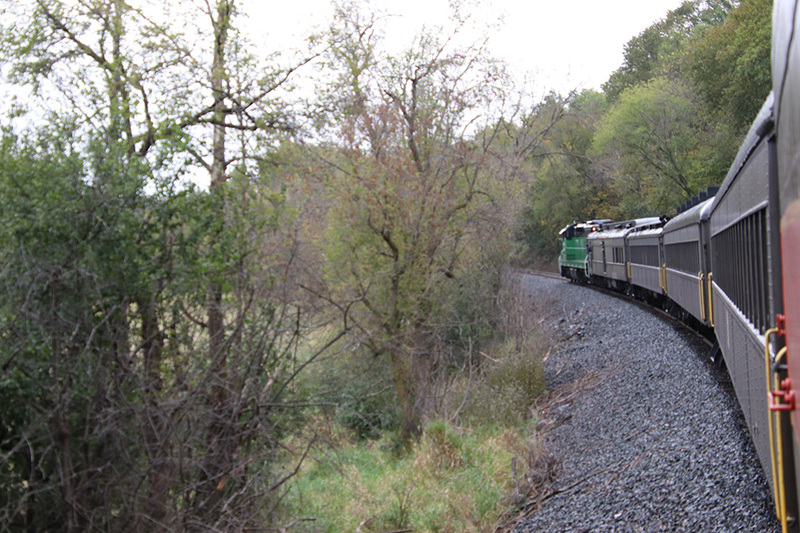 With locomotives on both ends, it can make 4 daily round trips between Osceola and Marine-on-St. Croix, Minnesota, the most scenic 10 miles of the 15-mile line. We first took the 5-mile trip to Dresser, which passes mostly through farm land. On the point was Burlington Northern SD9 #6234 (EMD 1959). There’s a .75 percent grade out of Osceola and the unit stalled due to west rail made slippery by fallen leaves. Thankfully, Great Northern SDP40 #325 (EMD 1966) was fired up and off we went. At Dresser we reversed direction, ran through Osceola, and headed down the extremely scenic St. Croix River valley to Marine. Boarding at the Osceola depot. The restored 1887 Dresser depot. Oct. 6 A second morning was spent in seminars and the vendor room. For the afternoon we bussed to the suburb of Excelsior, to ride the Minnesota Streetcar Museum’s Excelsior Streetcar Line. 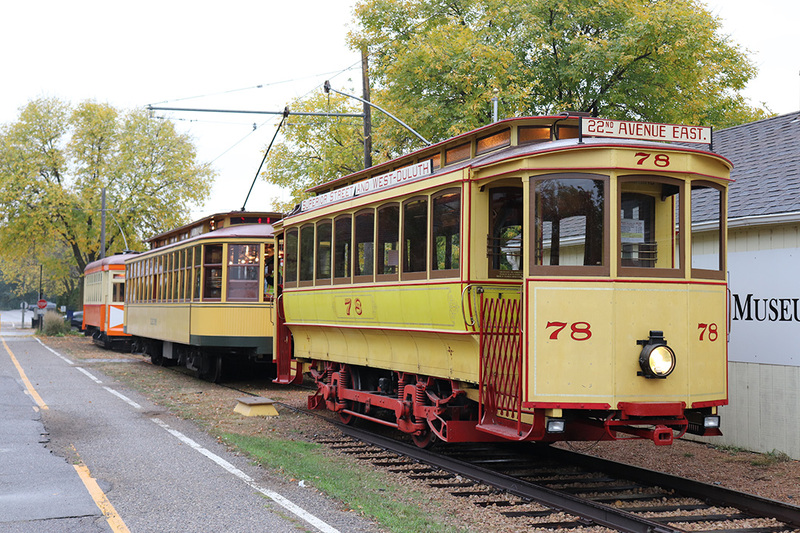 Three streetcars were operating, and it was the first public outing for Winona single truck streetcar #10 (St. Louis Car 1914), following a 13-year restoration from a stripped car body. Left to right: Winona 10, Twin City Rapid Transit 1239 and Duluth Street Ry. 78 outside the Excelsior Streetcar Line barn. Bill Graham photo. The conference featured the first ever 3-car operation at Excelsior. Tim Crain photo. Attendees then walked a block from the end of track to a dock on the shore of Lake Minnetonka. There they boarded the steamboat Minnehaha for an hour cruise on the lake. Operated by the Museum of Lake Minnetonka, the Minnehaha is wood 70-footer with a triple expansion engine. 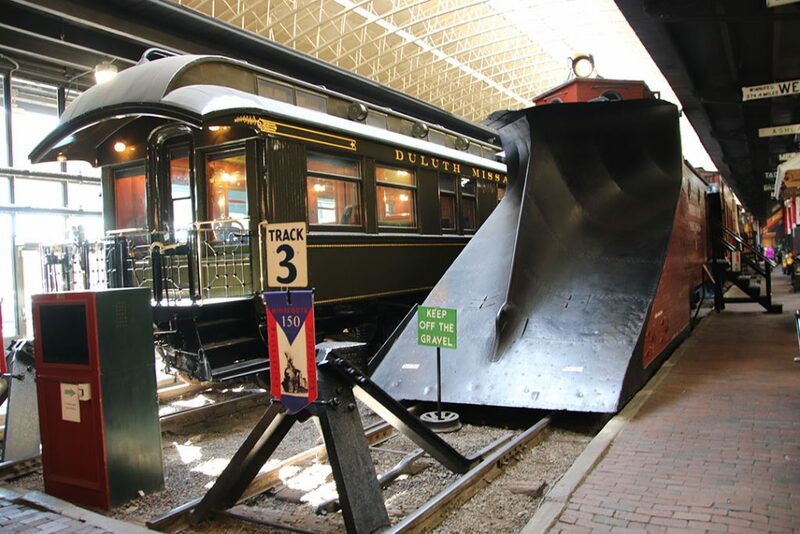 It was built by Twin City Rapid Transit in 1906 and served as an extension of the streetcar system. Four routes met the streetcars and provided hourly service to 27 docks on the lake. All the boats were sunk in 1926. The Minnehaha was brought up in 1980 and restored to service in 1996. Oct. 7 The days was spent traveling on vintage transit buses, first to the Minnesota Streetcar Museum’s Como-Harriet Streetcar Line. 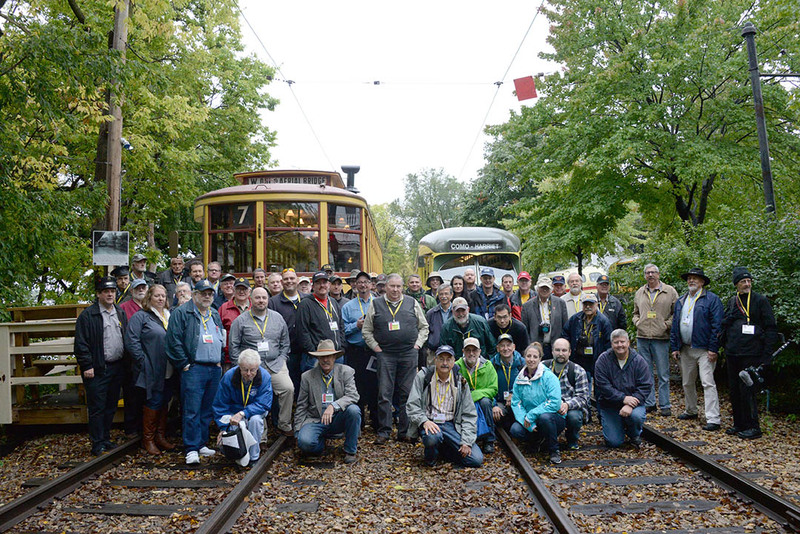 The attendees posed at the Como-Harriet Streetcar Line. Steve Heister photo. 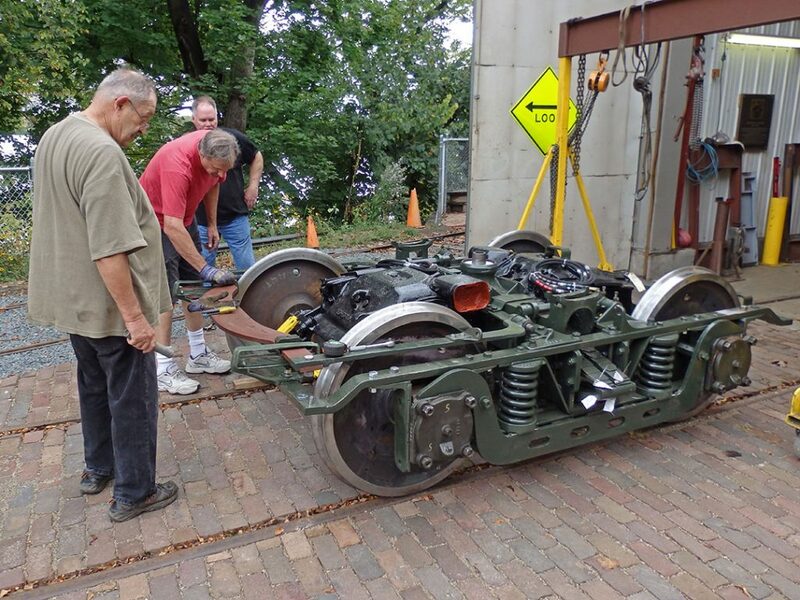 Two cars were operating, and visitors were able to see the final stages of rebuilding the trucks under Twin City streetcar #1300. Streetcar 1300’s rebuilt truck. Dennis Stephens photo. Vendor Rail Explorers demonstrated one of their rail bikes on a car barn spur. 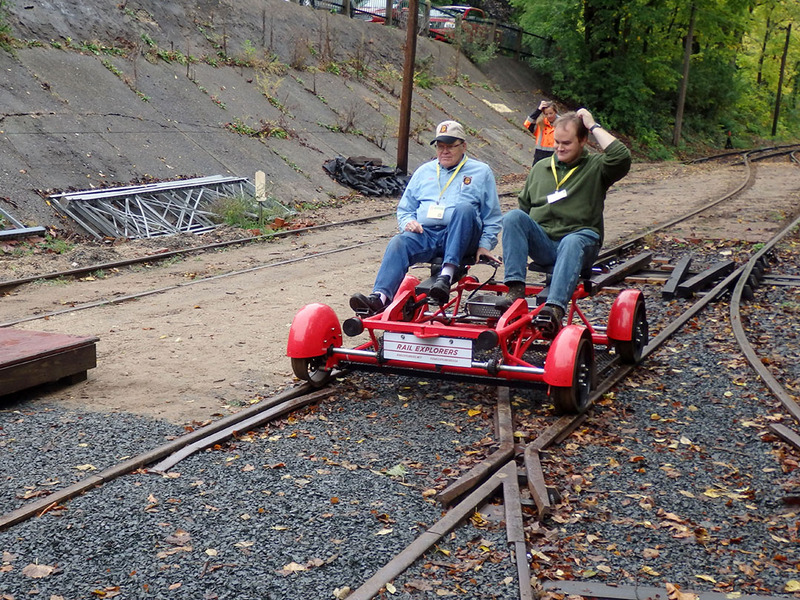 MSM volunteers John Prestholdt and Ben Franske try out the Rail Explorers rail bike. Jim Vaitkunas photo. The next stop was the Minnesota Transportation Museum’s Jackson Street Roundhouse. Built by the Great Northern in 1914, it was abandoned in 1959, and all the tracks were removed. It served as a Post Office facility for awhile, then hosed a series of light industrial tenants. The museum acquired it in 198_ and has restored it to an operating facility. The turntable came from the GN’s Minneapolis Junction when that roundhouse was demolished. It was a short hop to the majestic and recently restored St. Paul Union Depot. It only sees two trains a day, but the track level now hosts both intercity and local buses. The arched roof concourse has become a popular event venue. The Twin City Model Railroad Museum, located half a block from the old Amtrak Midway depot, houses a large O-gauge layout that features re-creations of a series of Twin City scenes. The last stop was the Milwaukee Road 261 steam shop. The big 4-8-4 was on display inside the former Great Northern diesel shop at Minneapolis Junction, along with a couple of the Friends of the 261’s large fleet of passenger cars. The evening ended with the banquet, annual meeting and awards ceremony.